Then, a few days ago, I saw that Beat Kiener had written a post detailing the specifics of how WeakEventListener really works. Where I focused more on saying why WeakEventListener is necessary, Beat does a great job of showing why - with lots of pretty diagrams and a detailed explanation. He even identifies a mistake users of WeakEventListener might make and outlines a simple tweak to the original implementation to prevent it! Beat's post is a good read, and I recommend it for anyone who's interested in this stuff. PS - If you think you have a memory leak, but aren't sure, this post I wrote about using WinDbg, SOS, and GCRoot to diagnose .NET memory leaks may be helpful. 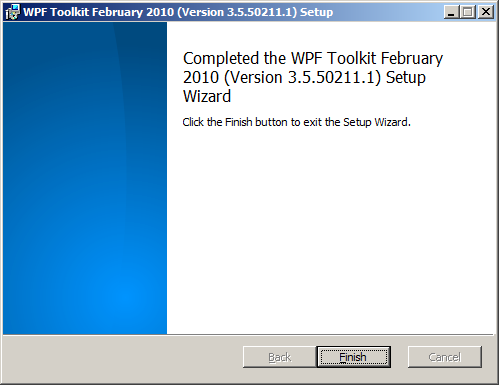 The WPF Toolkit team has just published the February 2010 release of the WPF Toolkit! In addition to a variety of bug fixes for DataGrid, DatePicker, Calendar, and Visual State Manager, this release also includes the latest changes to the Data Visualization assembly for Silverlight and WPF, bringing the official WPF implementation up to date with the November 2009 release of the Silverlight Toolkit. And because sharing the Silverlight Toolkit's Data Visualization assembly with WPF Toolkit customers has worked out so well, this release of the WPF Toolkit introduces three other controls from the Silverlight Toolkit: AutoCompleteBox (SDK documentation), Accordion, and Rating! Just as with the Data Visualization assembly, the WPF Toolkit implementation of AutoCompleteBox, Accordion, and Rating are almost identical copies of the latest Silverlight Toolkit implementations - we've even kept the same assembly names and structure. Therefore, everything you already know and love about these controls on Silverlight (including your code and XAML) should translate seamlessly to WPF! Even the Visual Studio 2008 design-time experience for these controls should be the same; we've brought the Visual Studio design-time assemblies over, too! Aside: This release of the WPF Toolkit targets the version of WPF that is part of .NET 3.5 (just as previous releases did). 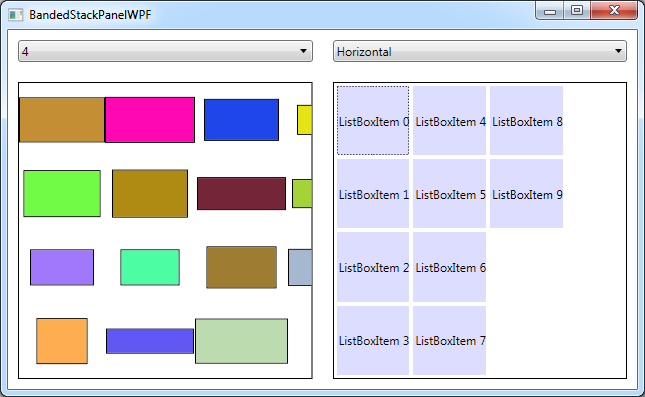 There isn't a version of the WPF Toolkit specifically for .NET 4 - largely because many of the controls in the WPF Toolkit were folded into WPF 4 itself! Release notes: For a summary of the changes to the WPF version of Data Visualization since the June 2009 WPF Toolkit and numerous code/XAML examples, please have a look at my announcements for the July 2009, October 2009, and November 2009 releases of the Silverlight Toolkit. It's always exciting when there's a new Toolkit release - and a bit of a relief because there's a lot of work that goes on behind the scenes to make these possible. I'd like to thank the WPF Toolkit team for their continued support of Data Visualization and for their willingness to include additional controls from the Silverlight Toolkit. In particular, I'd like to thank Patrick Danino who did nearly all the work to port the three new controls over to WPF, test them, and resolve a few platform incompatibilities that came up! His efforts went well beyond what I expected when he and I first talked about the idea and it has been a pleasure working with him on this. If any bugs happened to sneak through, it's not for lack of effort on Patrick's part. :) Please don't blame him - blame me instead! One of the big requests people have had for Silverlight was the ability to print, so one thing that's new in the Silverlight 4 Beta is the PrintDocument class which enables applications to print anything they want! There isn't an excess of fancy bells and whistles quite yet, but the support Silverlight provides is enough to do just about everything - it's just that sometimes you might need to do a little more than you expect. :) It's the classic "crawl, walk, run" approach to feature delivery, and this is a great first step that will be a welcome addition for everyone who's been wanting to print with Silverlight. Fortunately, a bit of mental debugging reveals what's going on here. Charting's data points fade in by default - from Opacity 0 to 1 over the course of 0.5 seconds via a Visual State Manager transition. That's cool and it works great in the visual tree - however, when you're creating print-specific visuals and immediately printing them, those data points don't have a chance to do much fading in... So they're actually all there on the printed page, but they're at Opacity 0, so you can't see them! What to do? Well, the most convenient thing would be for the Chart code to somehow know it was going to be printed and SkipToFill those pesky animations. But there's no official way for a control to know it's being created for printing. There are a few tricks the Chart could use to make an educated guess, but it doesn't do so yet - and I'm not sure that's the right answer anyway. So the next most obvious thing would be to re-Template the DataPoints to replace the default fading Template with one that doesn't fade, but instead starts fully visible. And as you'd expect, this works just fine - the data points show up and look great! 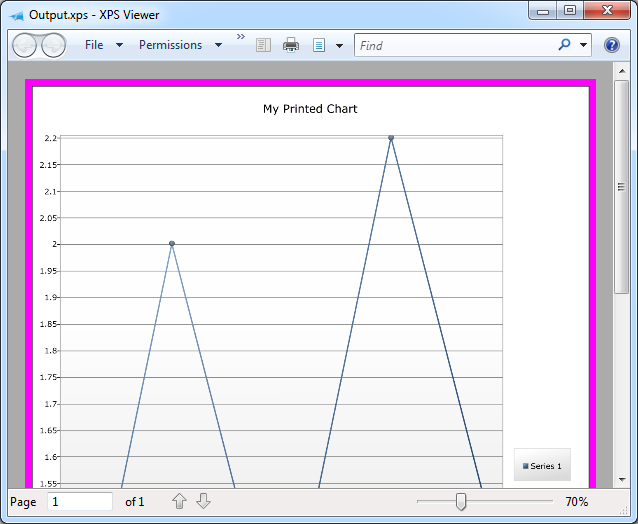 The Chart is added to the visual tree before the print dialog is shown - so it has plenty of time for those 0.5 second animations to play to completion while the user interacts with the dialog. The only sketchy bit is that an exceedingly fast user could possibly manage to print a Chart before the animations had run all the way to completion. Yes, well, I said it was a hack up front, didn't I? :) If you want rock-solid printing behavior, you probably ought to be re-templating the data points in order to ensure the initial visuals are exactly as you want them. But if you're just interested in printing something attractive with a minimum of fuss or inconvenience - and your users aren't hopped up on performance enhancing drugs - you'll probably be quite successful with this technique instead. PS - The XPS Printer driver is a fantastic tool for testing printing scenarios like this one. By printing to a file and opening that file in the XPS Viewer application that comes with Windows, I was able to avoid wasting a single sheet of paper during the course of this investigation. Highly recommended! Recently, I came across this article in the Expression Newsletter showing how to create a three-column ListBox. 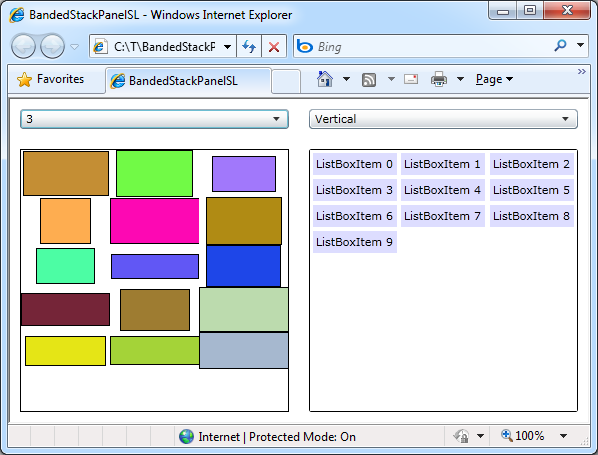 In it, Victor Gaudioso shows a Blend-only technique for creating a Silverlight/WPF ListBox with three columns. [And I award him extra credit for using the Silverlight Toolkit to do so! :) ] The technique described in that article is a great way to custom the interface layout without writing any code. But it can get a little harder when the elements in the ListBox aren't all the same size: a row with larger elements may only be able to fit two items across before wrapping, while a row with smaller elements may fit four items or more! 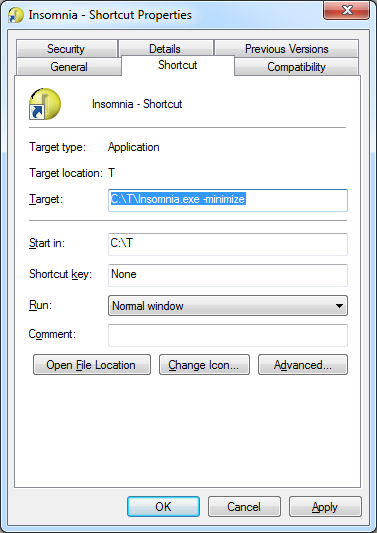 Such things can typically be avoided by specifying the exact size of all the items and the container itself (otherwise the user might resize the window and ruin the layout). But while hard-coding an application's UI size can be convenient at times, it's not always an option. For those times when it's possible to write some code, specialized layout requirements can usually be implemented more reliably and more accurately with a custom Panel subclass. Victor started by looking for a property he could use to set the number of columns for the ListBox, and there's nothing like that by default. So I've written some a custom layout container to provide it - and because I've created a new Panel, this banded layout can be applied anywhere in an application - not just inside a ListBox! The class I created is called BandedStackPanel and it behaves like a normal StackPanel, except that it includes a Bands property to specify how many vertical/horizontal bands to create. When Bands is set to its default value of 1, BandedStackPanel looks the same as StackPanel - when the value is greater than 1, additional bands show up automatically! And because BandedStackPanel is an integral part of the layout process, it's able to ensure that there are always exactly as many bands as there should be - regardless of how big or small the elements are and regardless of how the container is resized. That's pretty much all there is to it! The Silverlight/WPF layout system is very powerful and can be made to do all kinds of weird and wonderful things without writing a single line of code. But for those times when your needs are very specific, nothing beats a custom Panel for really nailing the scenario! /// Implements custom measure logic. /// Implements custom arrange logic.